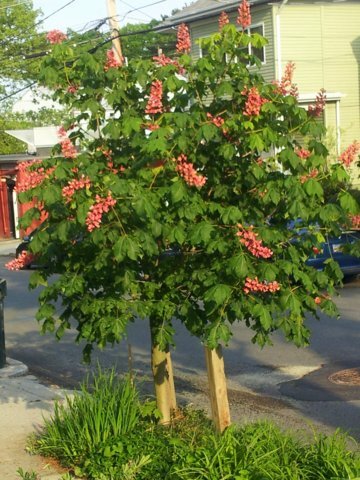 In 2008, I wrote about this lovely red horse chestnut that we helped plant in front of our house. The tree came courtesy of the Providence Neighborhood Planting Program and the Mary Elizabeth Sharpe Street Tree Endowment. 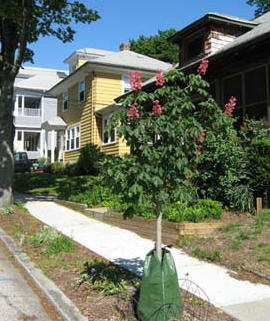 To qualify for the program, one neighbor serves as the lead and recruits at least five neighbors who agree to have trees planted in front of their houses. Neighbors agree to help plant the trees (the city digs the holes and drops in the trees, neighbors fill in the holes and agree to water and weed the trees). At a neighborly gathering last weekend to say goodbye to friends who are moving to Australia, we were looking down the street and admiring the trees that we had all helped to plant. The discussion brought back memories of the comaraderie and community pride that we felt as we gathered that fall day in 2007 to plant our trees. Here’s our tree in bloom just last month. It now bears a wound of urban life – having survived a gash in its trunk caused by a careless neighbor backing his car into the tree. But the tree stands strong and resilient. It’s a slow growing tree, but the promise is it will eventually stand about 35′ tall. So thank you to the Sharpes, to the city and to my neighbors for this beautiful living legacy. We enjoy your gift and its promise for future generations of street dwellers. Our neighborhood grows greener each day.